Ben Robinson is a popular scholar showman. He has entertained at such opposite extremes as 21 shows in one week at Hollywood's Magic Castle, and at the Base Camp of Mt. Everest (17,800 ft.). Hartford Courant drama critic Malcolm Johnson wrote of his first one-man show Out Of Order: "Ben Robinson's performance of silent, surreal illusions is MUST SEE entertainment." ee from his pants, to appearing in bathtub filled with water while playing a trumpet! 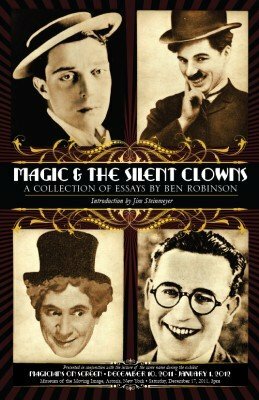 With an Introduction by noted illusion designer Jim Steinmeyer - The Trick Behind the Laugh - Magic and the Silent Clowns is an entertaining complement to silent film comedy appreciation, magic and popular entertainment. Includes 43 rare illustrations, all in color, some never before printed. Magic and the Silent Clowns was first presented as part of MAGICIANS ON SCREEN, at Museum of the Moving Image, December 10, 2011 - January 1, 2012, New York City. 1st edition 2012, 65 pages.